oth still and moving images stimulate emotive reactions and tickle our perceptual appreciation: be it news media with a barrage of sensational imagery, cinema with a plethora of dramatic narratives, documentary photographs, family albums or landscape images. Susanta Mandal is interested in what he claims is the "slippery zone" between still and moving moments captured in images. An element of playfulness and a pinch of irony exist in almost all his works. 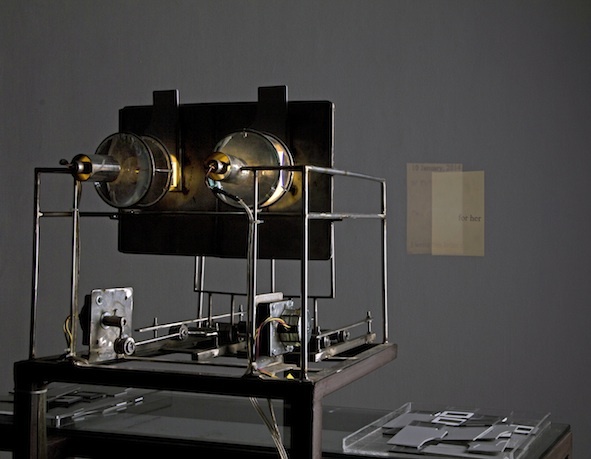 Through his art, he explores the mechanics of motion in a controlled environment of his own making through a series of devices, better known as kinetic sculptures. Mandal graciously agrees to walk me through his ongoing exhibition Hard Copy at Vadehra Art Gallery in New Delhi. As we chat, he takes me back to the experiences that have inspired and driven his art practice. Owing to poor eyesight right from his early childhood, Mandal confesses to having tried to examine things more closely, often squinting to see more clearly. It is no surprise then that Mandal uses multiple lenses and magnifying glasses in his work. This fascination furthers an interest in methods of scrutiny: how close can we observe something to be able to understand its nature? And then again, what are the things that we choose to focus on? His earlier piece titled It's a Routine Scrutiny from 2006 is an assemblage of photographs that is magnified (in part) by a magnifying glass that moves linearly in front of the images, highlighting a face, whole or partial, part of text or an object in the background, depending on what falls behind the glass. Quite obviously then, it questions observances of the mind's eye. While delving into the manner in which we read images: what they record and how they in turn are archived, Mandal began to study the devices that captured and projected images; cameras, image projectors and film paraphernalia. Aesthetically, Mandal's sensibilities lean toward an acute geometric minimalism. His use of light and shadow poetically highlights his preoccupation with the minimal and subliminal, with nostalgia and fragility. Modeled along the lines of the 17th century image projector, the triptych Magic Lantern is made up of three kinetic sculptures, each projecting an image from a slide: of a landscape, a home and a child. Mandal informs me that although the subject matter of the photograph is not the focus of his work, all three images draw from fond memories. All in all, the exposed mechanics of the projector-sculpture, the hum of the moving image and the light that helps us focus in the dark gallery room make for a rather surreal experience. Owing to poor eyesight right from his early childhood, Mandal confesses to having tried to examine things more closely, often squinting to see more clearly. It is no surprise then that Mandal uses multiple lenses and magnifying glasses in his work. This fascination furthers an interest in methods of scrutiny: how close can we observe something to be able to understand its nature? A meticulous and precise process of calculations is involved to ensure a specific speed of movement, a degree and focus of magnification and a timely sequential repetition of each image. To this, Mandal adds a deliberate tension, where the mechanics of each device is programed to an almost perfect score, allowing for the 1% element of chance. This keeps the viewer intimately and somewhat pensively engaged. Another piece in the inside room plays off our understanding of language, and of words. Again structured with lenses and focused light, the slides projected this time feature words extracted from official letters that are erased or scrambled to open up new meanings. Three slides overlap each other, lit planes on a dark wall emerging from the inverted reflection of the slides in the device, which itself casts shadows of its own. None of the works in the show are individually titled. They are all filed under the show's title Hard Copy, an obvious pointer to digital technologies and their mediums of storage. 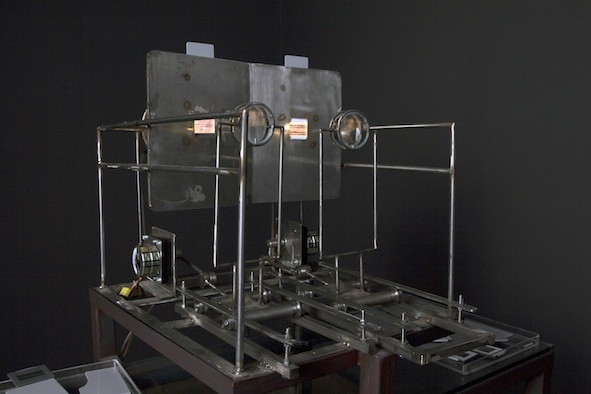 Positioned at the intersection between mechanical, digital and biological engineering, the show opens with a series of drawings of computerised tests of the human eye, leading to a minimal structural piece framed as a square of pipes, with a magnifying glass with a spotlight focusing on a specific area. On looking hard enough through the magnifier, I sense a motion, almost like a vibration. Whether it was my wanting to see some activity to explain the focal point of the work or an anxiety of not being able to see anything through the glass that was different from the rest, I certainly did sense an energy. The last piece of the exhibit is a display unit of Mandal's process of art-making. A drawing board with small sketches, lenses, again the play of light and shadows, all placed in an open vitrine cabinet where one can peer in to yet again "see" and scrutinise. Hard Copy remains on view at the Vadehra Art Gallery until 18 May, 2015. I don’t paint dreams or nightmares. I paint my own reality. This statement couldn't be more evident than in the practice of artist Masooma Syed. Born in Lahore, Syed's enrollment in art school was quite unplanned and the same strain of spontaneity reflects in most of her art. The ever-so-polite and rather shy artist took an evening out to accommodate my many questions while she ran me through the beginnings of it all. Conservatively raised by her grandmother, Syed's early days in school were spent amidst one of the most successful batches of the National College of Arts, Lahore. Her early works lacked the formalism and finesse of a trained hand, but were pure in their childish abstraction, imagination and freshness. They revealed a curiosity to experiment with diverse mediums like cosmetics and rusted metal — cheap materials that told of a modest living but more so of the inherent charm in inventing and discovering. Why paint with paint? Who prescribed that we do? Syed began another phase of self-discovery following her graduation. Doubts shadowed her beliefs, leading to a darker, sombre self and to macabre imagery. The overwhelming emotions translated into a series of works with hair and nails. When she looked at herself, she began with the body, and its outgrowths were examined anew. Like specimens in a laboratory, the clipped nails of her hands were arranged into ornaments of jewellery, a way of trivialising human vanity by decorating parts that were dead. The collected strands of hair belonging to her and her loved ones were cast in the form of feet, or a crown, held together by hairspray and reconfigured as art. The tactility of the form speaks of her painterly sensibilities — like layers of texturing with different strokes of the brush, while covertly conveying a distinct vulnerability. Like specimens in a laboratory, the clipped nails of her hands were arranged into ornaments of jewellery, a way of trivialising human vanity by decorating parts that were dead. I notice that Syed's art has not evolved linearly, for it is but a reflection of her many moods and thoughts and the delicacy with which she expresses herself — her speech is soft even when powerful. She speaks of a time when her art was unrestrained and free, when it enthralled both the maker and the viewer, and the burden of maturity that brought about a care for archival materials, preservation of forms and a means of livelihood was yet to come. Syed is not in the least bit resentful, but she acknowledges the role that chance and opportunity have to play in life. Her recent show titled Sublime West, hosted at Gallery Ske (New Delhi) last October was a solo exhibit presented after a six-year hiatus. Her deliberate shift to the larger scale, of juxtaposing cinema with newsprint displaying news of corruption and violence, and her employment of the theatrical stage was the result of harboured anxiety. It was an outpouring of her everyday struggles — of living between India and Pakistan, of reassembled emotions as well as a manifestation of all her curiosities: cut outs from family albums, film memorabilia, newspapers and magazines. When asked about her sources of inspiration and choice of subjects, she explains her work is not intellectualised; it is intuitive. Whatever is observed more keenly and felt more strongly creates more palpable imagery, even if small or fragile or degenerative. Who documents the lands that are unchartered and inhabitants who haven't as yet fallen under the census grid? I refer to the heavily forested areas of central India comprising a demographic that is a mix of rural and tribal, and remains one of the centres of the Naxal-Maoist ideology in India. Delhi-based photojournalist Ishan Tankha has been photographing these regions since 2008 on assignments for publications such as India Today and Open. His decision to continue his association with the people and the land as a freelance photographer since 2012 reflects a relationship of deeper understanding and a consequential need to draw a similar cognizance from others. Tankha's first trip to the region was rather dramatic; he ended up falling ill with the potentially fatal falciparum malaria combined with debilitating jaundice and typhoid. 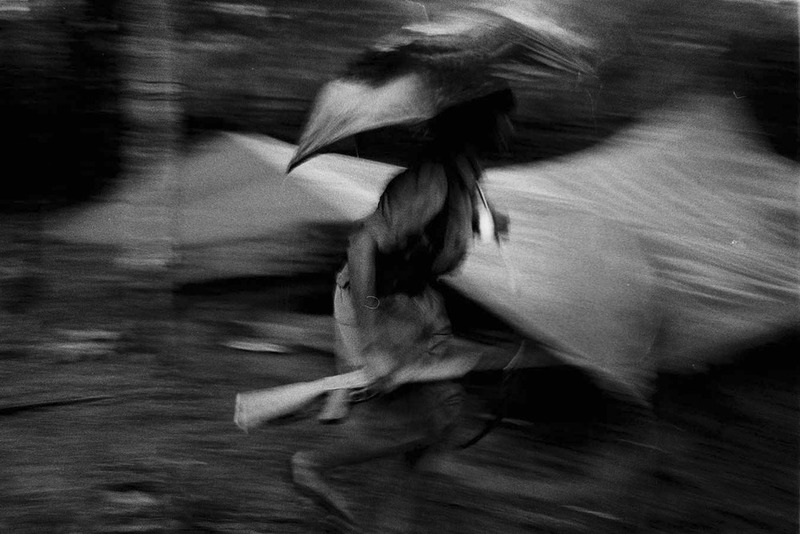 He made it back to the city in time and into a hospital, but another photojournalist on assignment did not and neither do most of the villagers living there. 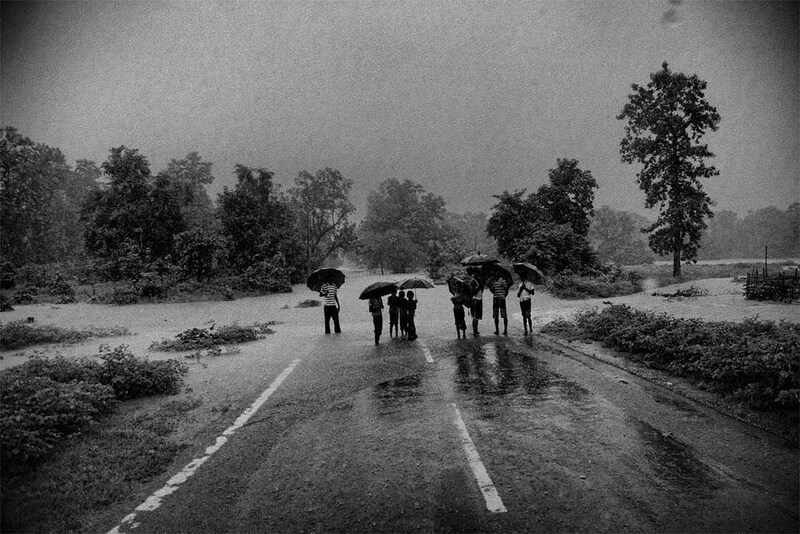 As I look through the black-and-white unedited images from his most recent trip made possible by the Danielou grant he won from the Europe Foundation for New Dialogue in 2013 (FIND), Tankha's images appear more as a narration of his experiences of engagement with the people than their cause per se. He enjoys taking portraits and informs me that for "these people" it is a matter of survival, a simple lack of choice. More people die of disease than of bullets. Photojournalism is a unique hybrid of spot photography and improvised storytelling. It requires both research and the experience to "make" a telling photograph. Photojournalists ostensibly help expand our "vision" of the world. Its origin as a discipline can be traced to the late 1920s, with the advent of smaller, more portable cameras that used the enlargeable film negative to record images. The introduction of the 35 mm Leica camera made it possible for photographers to move with the action, taking shots of events as they unfolded. Multiple frames presented as a narrative created a photo story, a departure from the illustrative manner in which photographs were earlier used with news reportage. Tankha confesses to liking the quieter, more unexpected moments. Quite often, it's not the gun in the frame of the picture that tells the story but the absence of it. My curiosity gets the better of me and I ask how much of the photojournalist's work is staged and how much does the image feed the context of the predefined story. It's a matter of ethics, both personal and professional. And at the end of the day, are some things not in need of a hint of fiction to have a greater impact? As I flip through images, I ask him how important titles are in helping understand the context of the photograph. Tankha picks out a picture of a man lying in the grass — drunk? Asleep? Dead? There's no way to tell. And perhaps that's where the photographer's instinct comes into play. What would he want you to believe? And how much does the context of being a "conflict zone" impact our understanding of the frame itself? It is a rather mischievous proposition that quietly and elegantly upsets the already precarious connections between what we presume to know and what is right in front of us. Tankha picks out a picture of a man lying in the grass — Drunk? Asleep? Dead? There’s no way to tell. And perhaps that’s where the photographer’s instinct comes into play. What would he want you to believe? And how much does the context of being a ‘conflict zone’ impact our understanding of the frame itself? But what prescriptions differentiate news from art? With an over-supply of images today, there is a parallel overlap in modes of representation and display. News images are making their way to gallery walls accenting an appeal of being truly contemporary — they represent a dimension of reality that is current and ongoing, and the photograph's placement ensures its longevity relative to when it was only an image in the news. I question the photograph's potential as a document of history, a way to record the collective memory of the landscape, and ask Tankha, what of the images I was looking at? He says he'd like to compile them as an economically made photo-book to be distributed amongst the people of the region, for them to have an album, a tangible document to share beyond the contrived history of conflict and stories they narrate to journalists and inquisitive others. Amitesh Grover is a theatre director, multi-media artist and more importantly, an interesting person. We met a few years ago over coffee and I remember us having an intriguing conversation that also involved my introduction to the concept of "social gaming". Grover wanted to explore the possibility of sharing thoughts and experiences, both personal and cultural, via digital media, with others located miles away. The interaction would be guided by an instruction-based game played by individuals who volunteered to participate in groups or otherwise. The outcome was unknown, often awkward, but sometimes intimate, as was intended by reality shows if not for their being scripted and sensationalised. Amitesh has since successfully organised many a game with collaborators in Australia, America and parts of Europe. I decided to participate in this season's social game, Encounter 6134, part of the Schwindelfrei Theatre Festival, Mannheim, Germany and in collaboration with the Goethe-Institut/ Max Mueller Bhavan, New Delhi. 6,134 kilometres marks the distance between the two locations of performative action. The broad topics of discussion were "Beauty", "Crisis", "Time and Death", of which I picked "Beauty" fearing the risk of being morbid with the others. 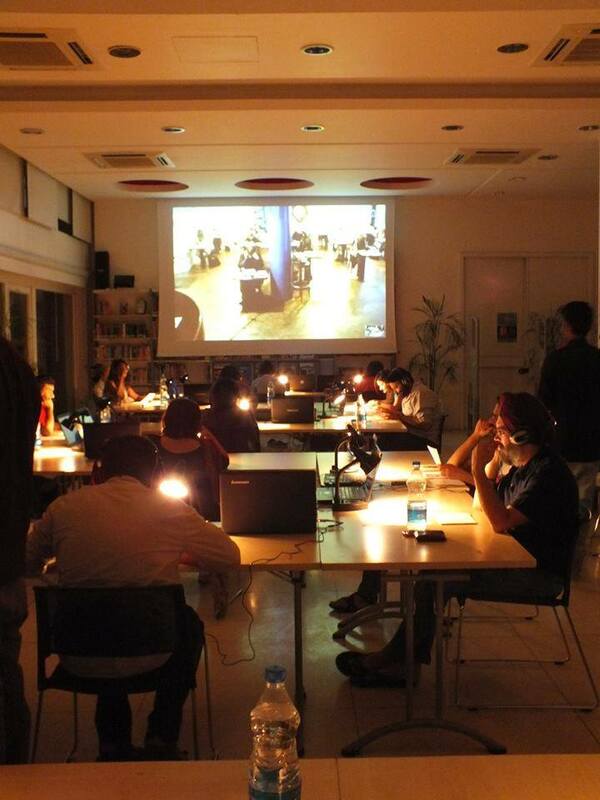 Scheduled over three days, with 20 participants per session, the "Encounters" spanned 19-21 September 2014. A bit reticent of participating, I hurriedly entered the Max Mueller library on the designated date and time and picked a seat at random, before anyone attempted to speak with me. In front of each person lay a set of headphones and a stack of cards on which were printed photographs and notes on the subject of beauty, along with a list of instructions on how to play. Once the connection to Mannheim was made, I was introduced to my partner for the evening — a young Lebanese performance artist who was in Germany for the duration of the Theatre festival. Nervously, we briefly introduced ourselves and went on to pick up the cards, each of which would be discussed and unanimously accepted or rejected. Quotes from Donna Hannaway, Roland Barthes, Hegel and Karl Marx along with other theories and social categorisations confronted our comprehension of beauty. I was surprised at how much our cultures shared, yet how much we differed as individuals, and midway, found it a strain to continue a serious conversation. I was reminded of my school days when we hid behind anonymity and allegedly cool aliases in social chat rooms, typing for hours and never knowing who we were really talking to. Then there were moments when the card demanded my complete attention and I forgot that I ever felt instrumentalised into sharing my thoughts with a stranger. However, the few breaks in connection snapped me back to reality, subjecting the game to the judgments of my mind, and leaving me feeling silly. From being the player, I was the one being played. But then again the conversation picked up and my polite friend in Germany and I continued to make sense of the strange topics in front of us. Before we both knew it, the line went dead halfway through a sentence; our designated hour was up. This was the end of the game. I barely realised how time flew! What was the purpose of our "Encounter"? Why did we not have a chance to conclude our conversation? If this is how I felt, how did she feel about talking to me? This episode of dramaturgy was about audience behaviour, part of a genre called interactive or immersive theatre. The stage is replaced by the virtual interface where gesture and body language is marginalised, leaving room only for spontaneity and honesty in thought and speech. It is about sharing. It is an experiential performance. Through the hour, both real and virtual space is shared yet one does not pay heed to the real. Needless to say, I grappled with deconstructing the encounter-experience, and imagined what Amitesh may have expected from its concept and design. To me, herein lay the "beauty".